There is a terrifying atmosphere around here and evrything seems to get too dangerous, but not for you, a scary ghost that choose to haunt the land to find her purpose. Join this adventure game to prepare yourself for a ghostly journey where you'll have to use all the tricks you've got to accomplish your mission. Possess people, animals if you have to, but don't forget your nature and why you are doing this. When you are a spirit you have some features that will help you out in many situations, but through when you are human your possibilities are limited, the only fact that is helping you in this case is the fact that you could actually turn the lights off. Stay away from light because that is something that could destroy you immediately, keep the distance and make sure you pass all those obstacles that are meant to slow you down. 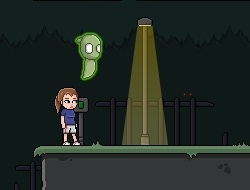 Being a ghost was never easy that's why you should consider to use the advatages you have to win this game. Make from this a fun adventure and keep challenging your skills. Use the arrow keys to move, M/ X key to get off the lights and space bar to possess/ unposses people. A ghostly journey 0.00 between 0 and 10 based on 0 votes.